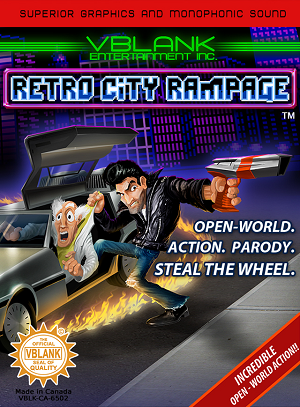 Several days ago, the release date of the North American release of the Retro City Rampage DX was given as 6th February, but today an European date was added for 2 weeks after the US date which is the 20th February. The DX edition which will be hitting the eShop which have features which were in the PC version update and also some exclusive features only found on the 3DS. One of these is a map which will be on the touch screen of the 3DS, which can be customised to show specific areas and landmarks. Also you re able to zoom the map, select weapons and change radio stations on the touch screen, as well.